I missed an important detail of the “Jimmies Experience.” It has taken a couple of beastly hot and humid days here in Woodbury to fully restore my image of Jimmies, and more specifically, of the parking lot. After a summer scorcher, the black top retained the heat well into the night. Forget about coming off the beach during the day and walking barefoot across the parking lot. The beating sun was not only “re-cooking” squished French fries, bits of discarded rolls, clams & etc. that littered the black top, but the heated asphalt would also do a number on your feet! You gotta know that those damned seagulls would be laughing their beaks off as you hot-footed your way to the counter! But even at night the surface of the lot radiated a warmth that intensified the rich scent of fried foods, pungent condiments & spilled sodas! 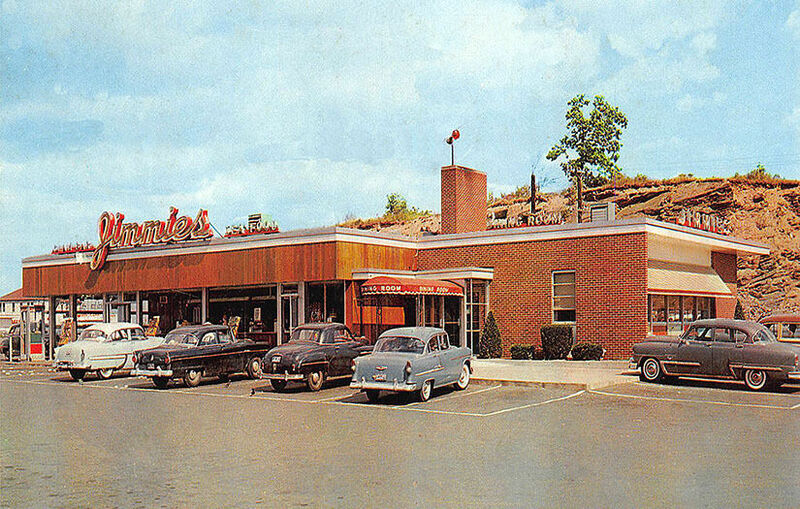 Yes, I loved the hotdogs, lobster rolls, fried clams, and French fries… but take away the parking lot, take away the cooking grill open to the air, take away a hot summer night and you have missed what made Jimmies so special (you can take away the seagulls). Ohhhh… to be transported back to a July Saturday night… to enjoy some clams on the half shell, two dogs, an order of fries and an order of fried belly clams – I can hear my arteries congealing now.